I'm working through the changes that I need to make to the rocker table design to avoid the problems that occurred this time. 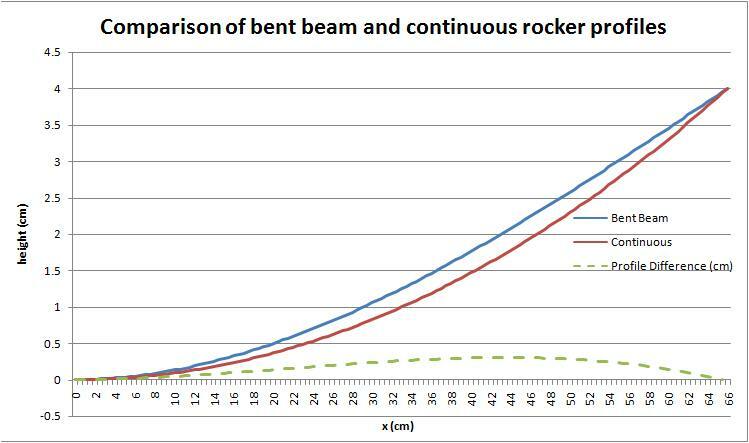 After coming across the beam bending equations in the last blog that describe the rocker profile you would get by fixing a flat surface at the middle edges and bending the ends up I wondered how close the profile would be to the continuous rocker that I had aimed at. 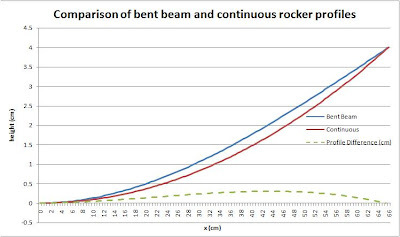 As you can see the bend beam is slightly flatter but the difference in the height of the rocker is about 3 mm throughout the section from about 38 cm to 51cm which is around where, at the front of the board, the board will sit above the water. This represents about 7.5% of the total rocker and when you draw a line horizontally through , say, the 2 cm height line it will result in about 4cm of board in the water when trying to go upwind. The question is whether this will make a material difference to the board (in particular the upwind performance) that can't be overcome with some additional concave, channels and most importantly riding technique. I don't know the answer to this. My guess is no but would be great to hear from anyone who has a better understanding.